Alden, I'm sorry if I have asked this before, but how is your cage so sturdy with no connectors? I have tried to use only zip ties and I just couldn't do it. I hate the connectors so much! It was a long process that benefited from having two adults involved in it. You have to pay special attention to corners when there are 3 panels coming together, and keep them straight and perpendicular and zip them super-tight. My husband used pliers to pull them even tighter than we could with just our hands. Also, you can see that there are steel reinforcements under the storage area and the first floor, which I think contributes a lot to the stability. I love seeing 3 grid cages! There is so much more you can do with them. Agreed. I didn't think it would make that much difference, but wow I love it! There is so much more room and the girls seem much happier. Everyone here has beautiful cages!! I love the bright colors of your cage! I love seeing everyone's cages. Here's my latest one. It's an L-shape 2x8. The main level is 2x5 and has a lower level 2x3 for kitchen. The kitchen is 4.5" lower than the main floor. GPigsRSweet, what kind of hay do you use? It looks pretty stalky in the picture, you can get much better quality hay from Oxbow (www.oxbowanimalhealth.com) or Kleenmama's (www.kmshayloft.com). Her hay appears to be Kaytee or something similar. I have literally sliced my fingers with Kaytee. We used it for a short time. babytulip07 and codyNpatches, it is Kaytee (sadly). I'm going to be getting better quality hay very soon. Possibly from a local horse farm. Thanks! Last edited by FlowersGrandma on Wed May 19, 2010 6:56 pm, edited 2 times in total. One large 2x10 with two 2x5s below. And then, both halves just in two pictures. 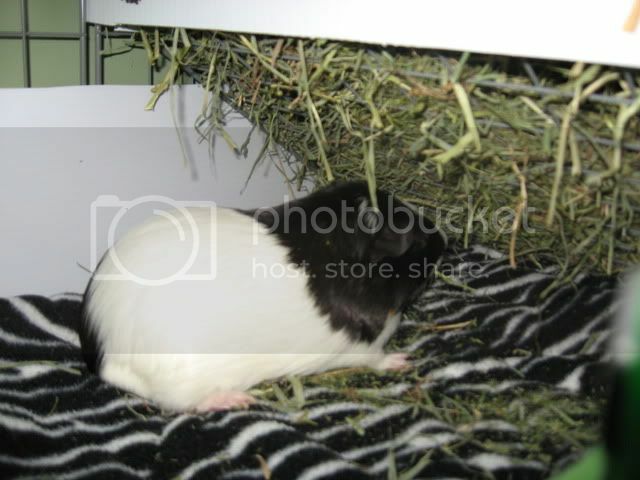 GuineaPigGoddess, I love your cage! Love the cages everyone! C&C Cages take so much time to make but when they're finsihed and have happy, popcorning pigs in them, they're beautiful! 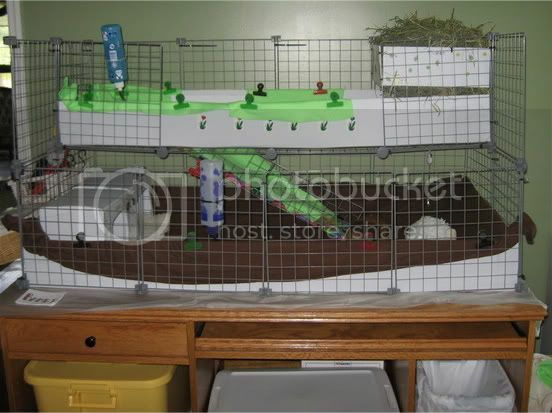 I like the bright colors in your cage, GPigsRSweet. 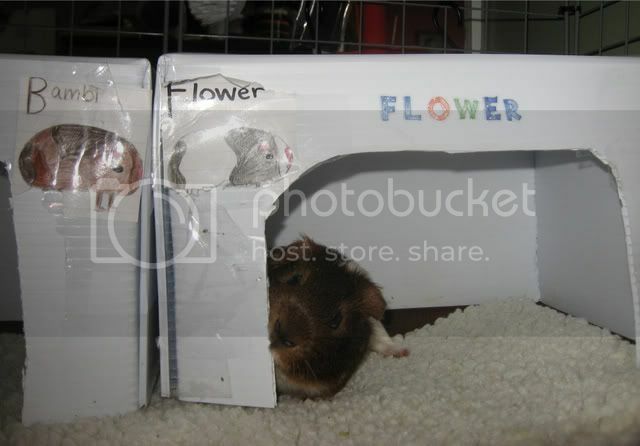 Bambi and Flower look so happy in their home! GuineaPigGoddess, your cage is so spacious! Is that a pink watering dish in the top? Do your guinea pigs like it? Thanks Lissie. It's just a grid at an angle the hay gets dropped on top. It holds a lot of hay at a time. They take about a week to eat through it. Tracis, Yup they love having the entire downstairs to romp and play. They have a bent grid hidie that they can run through and they can run up and down the ramp. Some times they get going. They've never known anything else really though so they sort of expect it. I used the petstore cage while I was waiting to put them together, but they were so tiny that didn't really matter all that much. Now they have plenty of room to grow and to chase each other. And it was WAY cheaper than the ones I see in the store that are WAY smaller. "that pink thing is a gravity feeder"